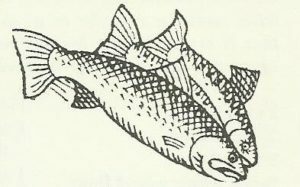 This make-alike version of Long John Silver’s popular fast food product appears on page 111 in “Gloria Pitzer’s Cookbook – The Best of the Recipe Detective” [published by Balboa Press (January 2018, 1st Printing) – a rewrite by Laura Emerich, of “Gloria Pitzer’s Better Cookery Cookbook” (self-published by Gloria Pitzer’s Secret Recipes, May 1983; 3rd Printing)], asking only for proper credit if you care to share it. 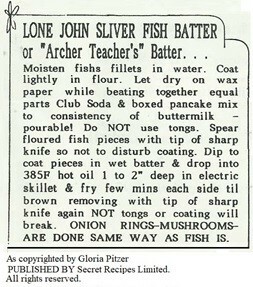 LONE JOHN SLIVER FISH BATTER – Similar in texture and flavoring to [The Recipe Detective’s] “Archer Teacher Batter”, but made a bit differently. 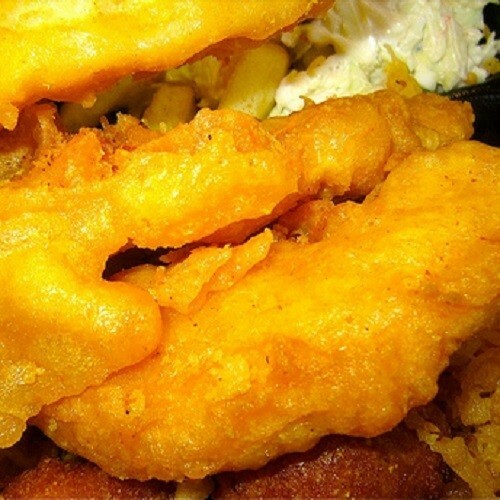 You can pirate your way through a seaworthy voyage of vittles with this crispy fish coating! 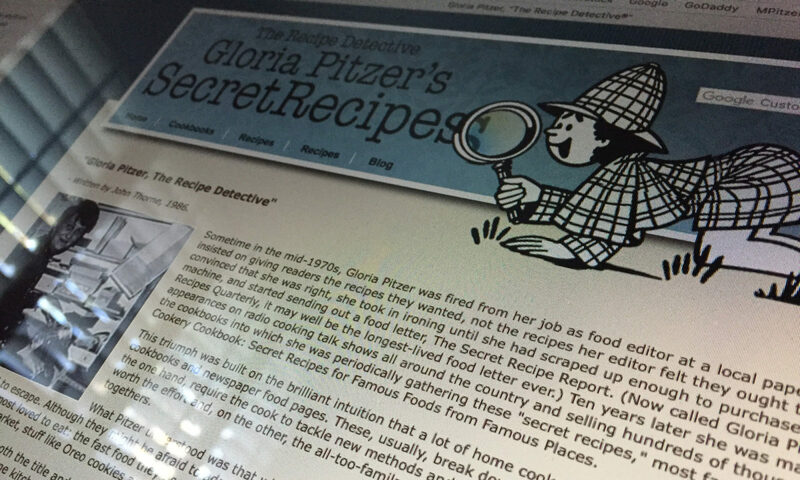 This picture (above) is of an updated version, to the one given below, from the Secret Recipe Detective’s “Free Recipes & Information” sheet (2000). Note: [Gloria] found, in later years, after the development of the version below, that the coating fried best (staying intact) in 385°F oil, as in the later version (above). 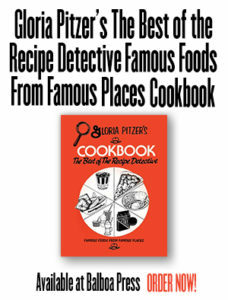 The make-alike version (below), of Long John Silver’s popular fast food product, appears on page 111 in Gloria Pitzer’s Cookbook – The Best of the Recipe Detective [published by Balboa Press (January 2018, 1st Printing) – a rewrite by Laura Emerich, of Gloria Pitzer’s Better Cookery Cookbook (Secret Recipes, May 1983; 3rd Printing)], asking only for proper credit if you care to share it. LONE JOHN SLIVER FISH BATTER is similar in texture and flavoring to The Recipe Detective’s “Archer Teacher Batter”, but made a bit differently. You can pirate your way through a seaworthy voyage of vittles with this crispy fish coating! Combine flour, biscuit mix, season salt and sugar. Set aside. Beat egg and oil, adding to half of the club soda or beer. Stir in flour mixture, plus enough more club soda or beer to make it the consistency of buttermilk. Stir in lemon rind and onion salt. Moisten fish fillets in buttermilk [or water as directed in my Arthur Treacher-style recipe (see Index.)] Drain fillets and dredge in plain flour. Allow them to dry a few minutes. Dip to coat in prepared batter and fry, a few pieces at a time, in 385-425°F oil/Crisco mix. When golden brown, remove and keep warm on a paper-lined cookie sheet in a warm oven until all pieces have been fried. Serve with Tartar Sauce – Serves 4 to 6 sensibly! Previous PostPrevious Mondays & Memories of My Mom – Entertaining!